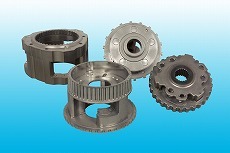 P/M parts have high cost peformance because of mass-production of complicated and precise parts at high production rate. Suitable material design is possible by choise of powder,density and so on. By bonding more than two components using brazing combined with sintering, complicated shapes such as undercut shapes which are impossible to form singly can be manufactured. 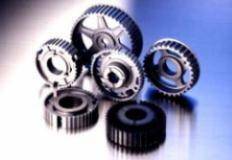 It is possible to join P/M components to the different kinds of materials (including wrought materials) at low cost. By using CNC press and new tooling technology, we developed the multi-level nearnet shape parts manufacturing which was difficult to design by the conventional powder compaction process. 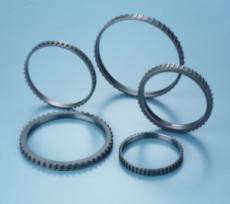 Ideal for its high-efficiency, long life, low noise due to extremely uniform, minimum tip clearance throughout the rotation cycle. Also, computer-aided design system for tooth profile or port profile, and computed evaluation system for performance or endurance enable quick response to variety of special customer requirements. 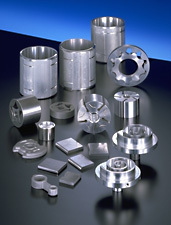 High Strength and toughness equal to that of steel are obtained by using special raw powders and combining special techniques, such as, warm compaction, high temperature sintering, coining and heat treatment. 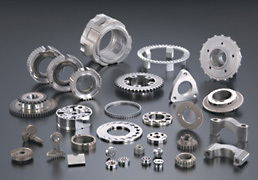 P/M stainless parts with complicated shapes high precision and having heat resistance, the corrosion resistance was manufactured by the idea of the improvement of the raw material and the manufacturing process. 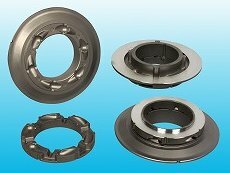 These materials have high strength, good wear resistance and heat resistance, and low thermal expansion compared with conventional casting alminum alloys, by using rapidly solidified aluminum powders. 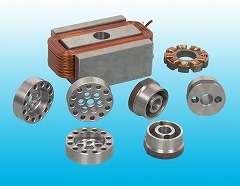 FMCM series products are made of nano-insulation-coated iron powders through compacting & heat treatment process. 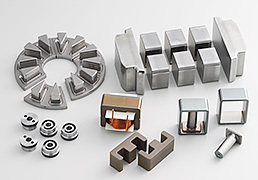 FMCM series exhibit high degree of 3D forming flexibility and superior magnetic properties in high frequency region.